Sweetie Pie Pasta Bowl 12"x 1 1/2". Saying reads "Honey, baby, sweetie pie, you're the apple of my eye." Sweetie Pie Cereal Bowl 6"x 2 1/2". On the back of the bowl the saying reads "Honey, baby, sweetie pie, you're the apple of my eye." 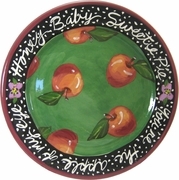 Sweetie Pie Dinner Plate 11 1/2". Saying reads "Honey, baby, sweetie pie, you're the apple of my eye."